Last week Jim Leone described the current state of the industry when it comes to using data to drive dynamic content for direct mail campaigns. He mentioned it’s an on-going process that continues to get better, but we haven’t reached our final destination. In much the same way, when it comes to multi-channel attribution and direct mail, we’re still evolving as an industry and the journey isn’t complete. Direct mail, like many marketing channels, can be used as a sales promotion tool, a CRM tool or as part of larger multi-step and multi-touch marketing campaigns. The challenges of attributing direct mail performance differ depending on how it is used. The biggest benefit direct mail offers is the ability to drive measurable positive response. In fact, direct mail has historically been the most easily attributed channel – people either called the phone number, returned the Business Reply Envelope (BRE), or visited the website on the piece (ideally through a pURL). The responses can be tabulated and the response rate calculated. Response rate continues to be the most common way of measuring the effectiveness of a direct mail campaign. However, marketers today want to know more than the percentage of response to a direct mail campaign. They want to know what the impact to other media response rates is due to the presence of the direct mail campaign. They also want to know what amount of response from the direct mail campaign they are not capturing because customers are going to search engines instead of picking up the phone. The methodology used for this approach is technically called modeled attribution. Modeled attribution attempts to isolate a percent of contribution per channel and determine the optimal channel mix. Modeled attribution has strengths and weaknesses. In my experience it tends to under value certain tactics and over value others. Clients may see that across all tactics, they believe direct mail is responsible for 20% of the total lead volume and has a 20+% lift to online. But what they quickly find out when they turn off the direct mail channel is that far more than 20% of the leads go away. The synergy between channels causes an exponential return, and removal of key channels such as direct mail can have an equally compounded negative effect. It’s important to note that this is true of other channels as well. A helpful way to view the importance of marketing tactics is to categorize them as upper funnel and lower funnel. Upper funnel tactics drive awareness and interest; lower funnel tactics capture that interest with offers designed to drive sales. Direct mail straddles the fence and can do both, while a tactic like Pay-per-Click (PPC) clearly harvests interest built from media and mail. There are several marketers and many attribution-oriented firms who are working to develop approaches for modeled attribution and the corollary media mix modeling. I have been involved at a cursory level with a few. The challenge is less about the technology and more about corporate process and agreement with internal and external stakeholders regarding the methodology. Online tactics can easily be tagged and results aggregated for analysis. 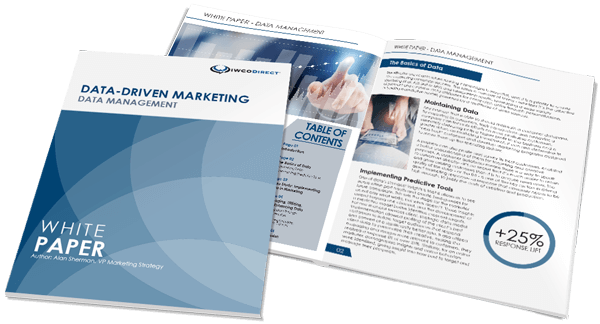 Companies like Convertro and Conversion Logic are working on marketing solutions for companies and agencies to help manage the process. It has been only recently that they have begun to include offline tactics in their methodology. Once implemented the dashboards and attribution information provide marketers with the information they need to dial up or pull down tactics based on their individual performance and their impact on the overall marketing effort. As you can see, we haven’t reached the final destination when it comes to multi-channel attribution, but we’re getting closer each day. Marketers and agencies should explore the companies and tools that are now available and establish a strategy. At IWCO Direct we take a very open approach to attribution while attempting to work with our clients’ selected strategy, whether it is modeled or simply last touch. In all cases we measure normative direct mail metrics such as Gross Response Rate (GRR) and Net Response Rate (NRR) and where appropriate will apply attribution logic to our planning recommendations. We also work with our own Data and Analytics resources to help develop attribution strategies for clients who want to take attribution or media mix modeling to the next level. If you have any questions about developing a multi-channel attribution strategy, please let me know.